Have you ever been in a situation where someone tells you that you will love a certain book so much that it actually puts you off picking it up? 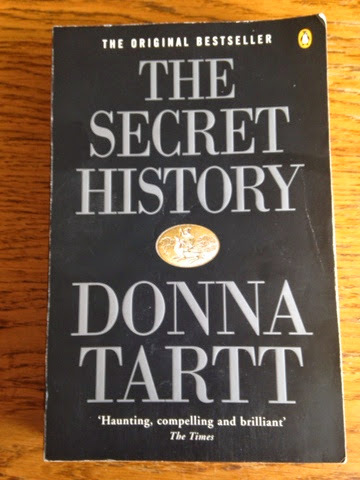 Well that happened to me with The Secret History, I was told left right and centre that it was the book for me- it revolves around the lives of a group of classics students, and as a classics student, it seemed like too obvious a choice to read. Anyway, I eventually put my pride aside and around Christmas time I picked it up and I haven't looked back since! I would describe The Secret History as a kind of murder mystery book, I say 'kind of' because to me it isn't your typical murder mystery or at least it was nothing like any of the crime/murder mystery books that I had ever read. The book is narrated by a boy named Richard who has gone to university and finds himself joining the classics department, a department made up of a group of secretive oddballs. It is important to be aware that Richard is narrating as I found that some of the horrific 'things' that occurred were almost muted by his narrative. I found that I got a bit caught up in the goings on and when I finished and really looked back on what had happened, it shocked me that what had happened hadn't shocked me (you will have to read it if you want to find out what these 'things' are!). Oh the wonders of a first person narrative! It almost reminds me of the Great Gatsby where Nick leaves out information and is able to almost control the reader and what the reader thinks simply by what he chose to write and how he chose to present the facts. There were many interesting characters to move the plot along: Henry the silent intellect (possibly my favourite of the characters), Francis, Bunny and of course the twins Charles and Camilla (yes, really!) and of course their lecturer Julian. I felt as though they each offered something different and valuable to the story, and they each had very different personalities. Of course, as a classics student I definitely appreciated all the references to the the classical world- Greek tragedy etc, but Tartt wrote about it in such a way that it is very accessible so it doesn't require any previous knowledge. My only complaint is that the book is dominated by male characters, there is of course Camilla but I don't believe she was a particularly strong female character and was often just the other half to Charles or the object of Richards desires. I'm not sure if that was Tartt's intention and she was trying to make a point that I missed but personally I would have liked to see a stronger female character. So, is it worth reading, I hear you ask? DEFINITELY! If I was to recommend one book to read, it would be this one. I often find it hard to define my top ten favourite books as there are just so many contenders, but this one is without a doubt up there! The Secret History also featured in my post about books that have shaped my life and I am currently reading her second book Little Friend and I can't wait to start Goldfinch which has been dominating the book charts since it was released!